Even in the early 20th century, when Islam had little presence in most parts of the United States, the religion had a foothold in many black urban communities. 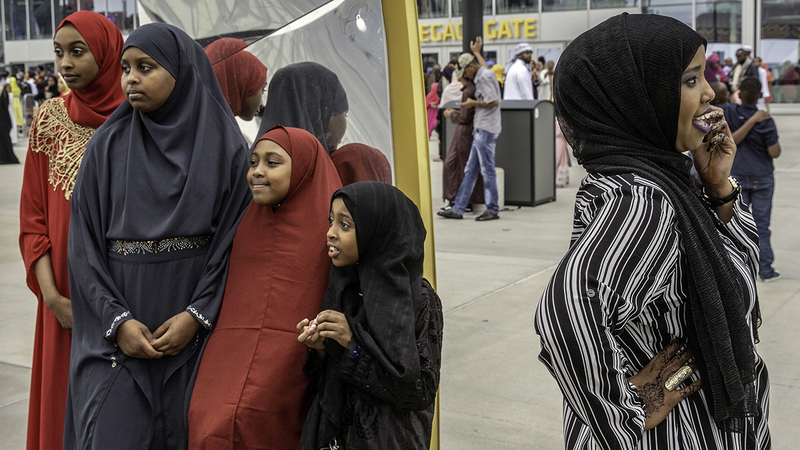 Today, black people (not including those of Hispanic descent or mixed race) make up 20% of the country’s overall Muslim population, according to a 2017 Pew Research Center survey. Still, Muslims make up only a small portion of the overall black population in the United States. The vast majority of black Americans are either Christian (79%) or religiously unaffiliated (18%), while about 2% of black Americans are Muslim. 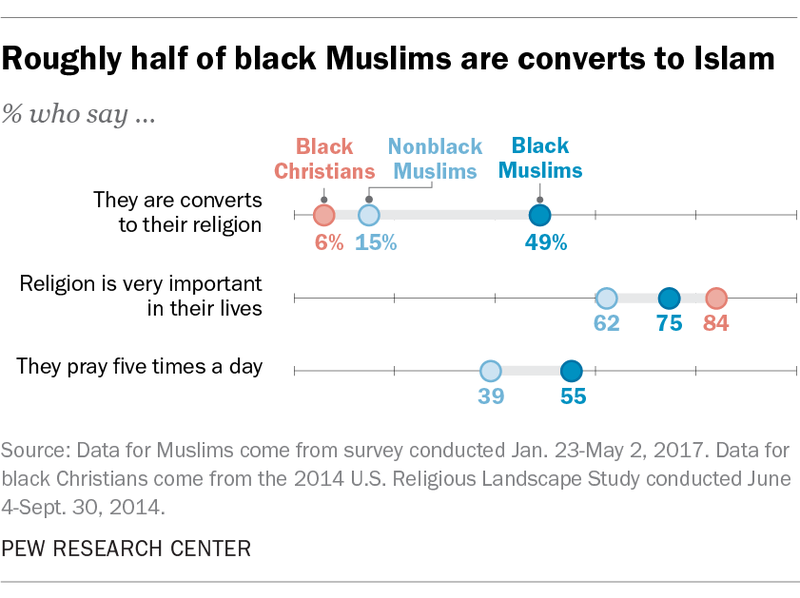 About half of black Muslims (49%) are converts to Islam, a relatively high level of conversion. By contrast, only 15% of nonblack Muslims are converts to Islam, and just 6% of black Christians are converts to Christianity. Black Muslims are like black Americans overall in that they have high levels of religious commitment. For instance, large majorities of both black Muslims and black Christians say religion is very important to them (75% and 84% respectively). This is a higher level of commitment than for nonblack Muslims (62%). Black Muslims are also more likely than other Muslims in the U.S. to perform the five daily prayers (55% vs. 39%). In the early 1900s, some Muslim religious leaders in the U.S. asserted that Islam was the natural religion of black people, broadly drawing upon the narratives of African Muslims captured centuries ago and sold as slaves in the Americas. Most prominent among the groups saying this was the Nation of Islam, which was originally founded in 1930 and is currently led by Minister Louis Farrakhan. Today, just two of every 100 black Muslims surveyed say they currently identify with the Nation of Islam. Instead, most black Muslims say they are either Sunni Muslims (52%) or identify with no particular Islamic denomination (27%). However, it is worth noting that the 2017 survey did not ask Muslims if they had ever previously identified with the Nation of Islam – an important point because many black Muslims, including prominent American Muslim figures such as Muhammad Ali, Malcolm X and Imam W. Deen Mohammed, were members of the Nation of Islam before coming to associate with other types of Islam. In general, black people in the U.S. are more concerned about the state of race relations than are people of other races. But black Muslims do not completely share the views of black Christians or nonblack Muslims on these issues. 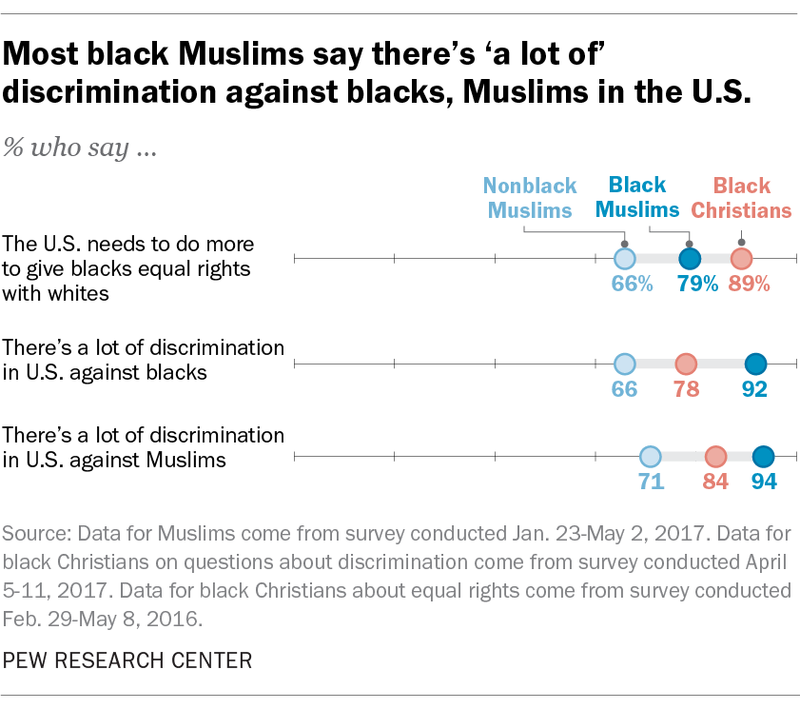 For instance, about nine-in-ten black Muslims (92%) say there is a lot of discrimination against black people, compared with 78% of black Christians and 66% of nonblack Muslims. And 79% of black Muslims believe the United States needs to continue making changes in order for blacks to have equal rights with whites. By comparison, nonblack Muslims are less likely (66%) to say this. 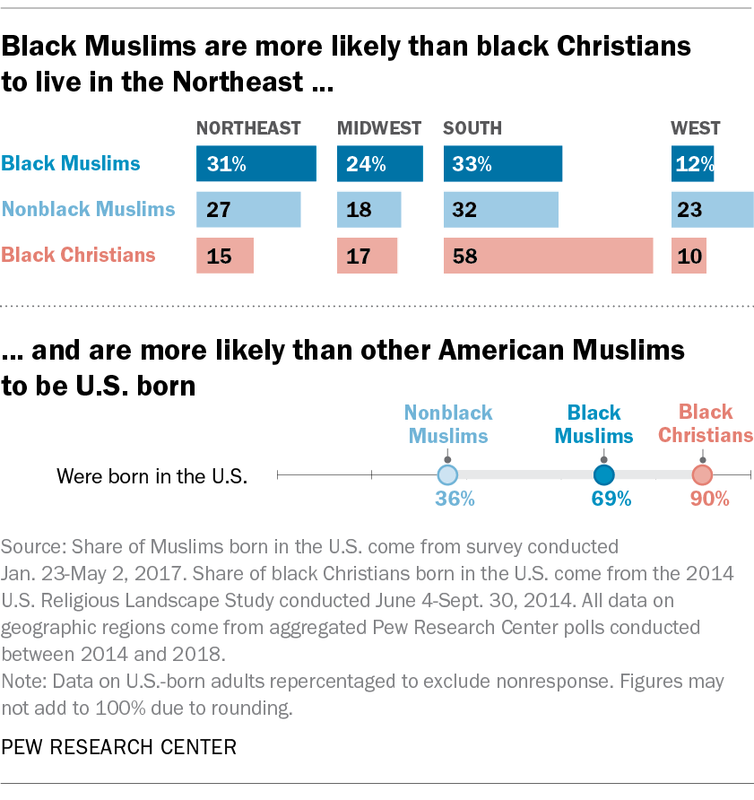 Geographically, black American Muslims are more likely than black Christians to live in the Northeast, while black Christians are more densely clustered in the South. And black American Muslims, like U.S. Muslims overall, are more likely to live in urban areas than are black Christians. In addition, black Muslims are much more likely than nonblack Muslims to have been born in the United States (69% vs. 36%), though less likely than black Christians (90%). Aside from those born in the U.S., many black Muslims come from sub-Saharan Africa, including countries such as Somalia and Ethiopia. By contrast, the most common places of origin for nonblack Muslims are south Asian countries, such as Pakistan. Correction: In a previous version of this post, the source notes in the first and third charts misstated which demographic group data came from the Center’s 2017 survey. It was data for Muslims.